I wish you a beautiful and sunny summer Sunday! After more then 20 years, our very own Ritchie Blackmore (finally) recorded a brand new rock track by the name of “Waiting For a Sign”. Rainbow (also known as Ritchie Blackmore’s Rainbow or Blackmore’s Rainbow) is a British rockband led by guitarist Ritchie Blackmore, former legendary guitar hero of “DEEP PURPLE”. He was one of the founding members of DEEP PURPLE in 1968. 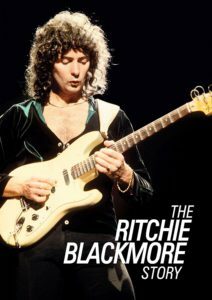 Blackmore quit the band in 1974 to front his new group, Rainbow, active from 1975 until 1984, 1993 until 1997, and 2015 until present. 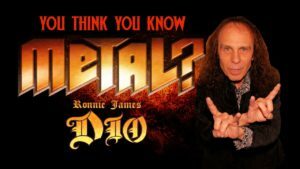 They were originally established with Ronnie James Dio’s American rock band Elf, but after their first album, Blackmore fired the backing members and continued with Dio until 1979. 1979 Black Sabbath’s iconic front man Ozzy Osbourne’s regular use of alcohol and other drugs led to his dismissal from the band. He was replaced by Rainbow vocalist Ronnie James Dio. He is credited with popularizing the “metal horns” hand gesture in metal culture and was known for his medieval-themed lyrics. Three British musicians joined Rainbow in 1979 – new singer Graham Bonnet, keyboardist Don Airey and then-former Deep Purple bassist Roger Glover – and this line-up gave the band their commercial breakthrough with the single “Since You Been Gone”. Over the years Rainbow went through many personnel changes with no two studio albums featuring the same line-up. The singers Joe Lynn Turner and Doogie White followed Bonnet, and numerous backing musicians have come and gone. A pioneer of power metal, the band’s early work primarily featured mystical lyrics with a neoclassical metal style, but went in a more streamlined, commercial direction following Dio’s departure from the group. Rainbow were ranked No. 90 on VH1’s 100 Greatest Artists of Hard Rock. The band has sold over 28 million records worldwide, with 1,420,000 copies in the UK. 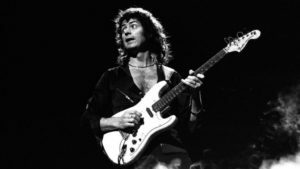 The bonus track of today includes Ritchie Blackmore’s most legendary guitar solo,, over decades generations of guitar players tried to play it. Today’s second bonus track ( because it’s Sunday ) includes the world’s most famous guitar riff ever over half a century of heavy metal music. The song’s about a fire in the Casino Of Montreux / Switzerland, where the annual legendary Jazz Festival takes place since decades. Take a guitar and play the riff, it’s as simple on the one hand as it’s brilliant on the other. I wish you a relaxed Sunday and come back soon with a new story.